Berliet belongs to the most famous firms that have ever produced lorries, many of which have become widely known. Almost for 80 years of existence on it created over a thousand different models of trucks and hundreds of engine options. Many of the best cars "Berlie" appeared thanks to the talent of one of the most famous auto designers of the world - Marius Berliet (1866-1949). Marius Maximin Francois Joseph Berlie was born in the large family of the small Lyon manufacturer of satin lining fabrics for headwear, Joseph Berlie. In 1921, he met the first gasoline crews and decided to devote himself to the creation of self-propelled vehicles. In 1893, Marius developed the design of his first passenger car and built it himself the next year. After the death of his father in 1899, he completely converted the family workshop to his technical experiments, and soon moved to the quarter Monplaisir, in the premises of the ruined firm Odiber e Lavirott (Audibert et Lavirotte). By 1905, Berlin had already employed 250 people, who collected three hundred cars. In June 1905, the vice-president of the American ALCO company, Mr. Pitkins, arrived at the firm, and on July 1, Berliet signed a contract with him for the licensed production of his cars in the US. This event was the starting point in the history of the company "Berliet", which allowed to expand production and organize the production of trucks. Since the main products of the American partner were locomotives, from then on the emblem of Berlin became the silhouette of the Overseas logo - the first "Berliet" car for cargo transportation became in 1902 a van on the chassis of a standard passenger car, and the first cargo chassis with a 24-liter engine .from. Collected in 1904. Two years later, a new 2-ton prototype with a 4-cylinder engine with a working capacity of 6.3 liters and a power of 14 hp, a 4-speed transmission, a chain drive to the rear wheels, an open platform on four massive wooden wheels With iron rims and driver's seat above the engine. In the first year, only 12 cars were sold, and from 1907, on their basis, trucks of the "L" series were collected - only 37 pieces. They were followed by a 3.5-ton, successful model "M" car with a 4.5-liter engine. Capacity of 22 hp. In 1911 the production of classic hood trucks CAD and SAK, equipped with unified 4-cylinder engines with a stroke of 140 mm, multi-plate clutches, 4-speed gearboxes, chain drive and drum brakes, began. The engine feature for the SAK model was two camshafts for a separate intake and exhaust valve drive, as well as a compression retarder. By this time, Berliet had offered trucks in 32 variants. To expand their production, he bought a piece of land in Venissieux, the eastern suburb of Lyon, and proceeded to build a new factory, where subsequently the assembly of trucks was later transferred to the conveyor for the first time in France. In 1913, "Berliet M" became the basis for one of the most famous trucks of the first period - a 3.5-ton model "CAT" with the driver's seat above the engine. Just before the outbreak of the First World War, an even more popular SVA classic-style truck with a 4-cylinder Z-series (5.3 liters, 25 hp) with aluminum pistons, multi-plate clutch, a 4-speed Gearbox in the block with the main transmission and differential and ball bearings in the transmission. With its own weight of 3580 kg. "Berliet SVA" could carry 3,5-4 tons of cargo at a speed of 30-35 km / h. In 1912, the "Berlin" already employed two thousand people, and in the program of 1911-15. Included 23 models of trucks, including light vehicles "CAC" (10 hp), 3.5-ton "САМ", special chassis "CAU" and buses "SAO". The company "Berliet" controlled at that time 65% of the national production of trucks. Its financial situation was strengthened by large state orders for shells and light tanks "FT17". During this period, "Berliet" by 30% exceeded the American "Ford" (Ford) in terms of production of trucks and the number of employees in this area. But in peacetime the flow of profitable orders has dried up. "SVA" was the only representative of the cargo program "Berliet", and Marius continued until 1932, his release in 10 versions (before the model "PLEASURE"). Deciding to use the ready-made chassis, based on the American Studebaker, Berliet built a light model of "VB". For its manufacture, the best grades of American steel and the remaining high-quality materials that were not used during the war were used. Such luxuries in difficult years led the firm to the brink of bankruptcy and made it look healthy for life. In 1923 - Berliet launched a new range of trucks "VL", "VM" and "VH". On light model "VHA", capable to develop a speed of 60 km / h, in 1924 electric lighting appeared for the first time. A three-ton "VMP" with an engine capacity of 3.3 liters. Received in 1925 the brake servo, and one of the world's first 3-axle vehicles "VPD" (6 × 4) in 1926 was successfully tested in a two-month run through the Sahara sands with a length of 2,800 km. - from Algeria to Niger and back. It was a cargo-and-passenger variant for 8 people and 500 kg. The cargo, equipped with a 6-cylinder engine with a capacity of 120 hp. With an electric starter and a 4-speed gearbox. Gradually, the position of "Berlin" stabilized, and the factories in Monplaisir and Venissieu earned at full power. In the early 30's. From their gate came a variety of 2-and 3-axle gasoline cars: delivery "VIL", "VIR" and "VIR" with a carrying capacity of 1.2-2 tons with engines with a working volume of 1.5-2.4 liters. Medium "VD" and "VS" for 4-5 tons, as well as 1 tonne pickups of the model "944" - the lightest trucks of the brand "Berlie" on the chassis of the passenger car series "VIRL". In the meantime the "era of dieselization" was approaching, and Marius Berliet clearly felt the need to move to a fundamentally different type of engine. In the beginning of 1930, he traveled to Germany and met with Robert Bosch, Deutz engineers, and acquired a license for the Akro (Asgo) direct fuel injection system designed by engineer Ackroyd Stuart. In June 1930, the drawings of the new engine were ready, and on September 15 they assembled the first 4-cylinder diesel Berliet MDA. In November, it was placed on the chassis "JVAS". After a small modernization in January 1931, the diesel was installed on the experimental 3-axle cars. But the first versions of the engines were unreliable, and customers who bought such trucks, told the company a protest. Berlin had to assemble a team of repair workers who replaced in place 600 defective block heads in order to restore the company's reputation. Nevertheless, in 1932, three new diesel engines were launched at Berlin: two 4-cylinder and one 6-cylinder diesel engines, and the whole subsequent history of Berliet became closely linked to diesel engines. Success was facilitated by the start of production of a successful series of "GD" with a payload capacity of 6-7 tons, produced before 1953 in a large number of modifications. The first serial 4-cylinder diesel with a working volume of 7250 cm3 was installed on a 2-axle truck "GDHL" and in 1932 it was successfully tested in the next trans-Saharan run. Since 1934 the program "Berlin" has the heaviest model "GDM" with a gross mass of 20 tons with a 6-cylinder diesel engine with a working volume of 10850 cm3 and a 4-speed box with accelerating transmission. Up to 1953, 7 thousand such cars were manufactured. In 1935, instead of the "SVA" series, a new family of "GDR7" with a load capacity of 5.5 tons was launched with an all-metal cabin and an upper-valve 4-cylinder long-stroke (110 × 155 mm.) Diesel engine, "MDF" (5.7 liters, 75 Hp). In 1936, Berliet decided to switch to more reliable engines with an oval pre-camera under the license of "Ricardo" (Ricardo). They were produced in 4 and 6 cylinder versions of MDF3 and MDB4 with the same dimension (120 × 160 mm. ), Developing the power of 75 and 95 hp. Diesels were successful: they were installed on 11 models of trucks Series "GD", "GC" and "GP" with a carrying capacity of 5-15 tons. Then the first GDR trucks appeared with an all-metal cab above the engine. Meanwhile, in the car market, the company could not withstand the onslaught of the strongest competitors and shortly before the Second World War, it released its latest light car Dauphine. At the same time, a new family of diesels "MDJ" with a spherical vortex chamber "Ricardo Comet Mk II" was launched. Anticipating the approach of a new military conflict in Europe, Berlin launched a mass production of machines with gas-generating units (the most famous is the VDANG model), and also began developing a range of military trucks "GDR", light reconnaissance vehicles "VPD" and armored cars "VPC". However, in September 1939, Berliet received a strange order for the manufacture of shells, but refused to produce them, offering the government their cars. In the period 1941-46 years. The company produced 18 thousand gasoline and 6 thousand gas-generating machines. The Berliet plants that remained in the non-occupied zone of France were destroyed by American aviation on May 1, 1944, and on Mar. 4, Marius Berlie was arrested for refusing to execute the military order of his homeland and for the fact that his trucks were in service with the German army. All the affairs at the enterprises of "Berlin" began to deal with the youngest son Paul Berlieu (born in 1918). His father appeared before the court only in 1946 and was sentenced to two years in prison with confiscation of property and the prohibition of living in departments near Lyon. A year later, he was released, rewarding a lifetime pension of 120 thousand francs a month. In the spring of 1949, Marius Berlie was awarded the second Order of the Legion of Honor (the first he received back in 1911), but on May 17, 1949, he passed away. The first post-war years proved extremely difficult for the company "Berliet". Production of trucks began in late 1945 with a slightly modernized pre-war model "GDR7" with a 4-cylinder diesel engine "MDB4C" with a capacity of 85 hp. With the modified head of the "Komit" block of the III series. In the first two years of peace, only 600 chassis were manufactured, and in general for the period 1946-49. The volume of production reached only 10% of pre-war indicators. In 1950, the company announced the launch of a series production of a new range of bespokotnyh machines "GLA5" with a total weight of 7.5-8.5 tons with a more modern cabin above the engine and a pre-chamber diesel engine "MDJ" with a working volume of 5 liters. Capacity of 75 hp. It was possible to start serial production only three years later. Since 1956, produced two modernized models "GLA5R" and "GLB5R" with 4 and 5 cylinder engines in 80 and 100 hp. 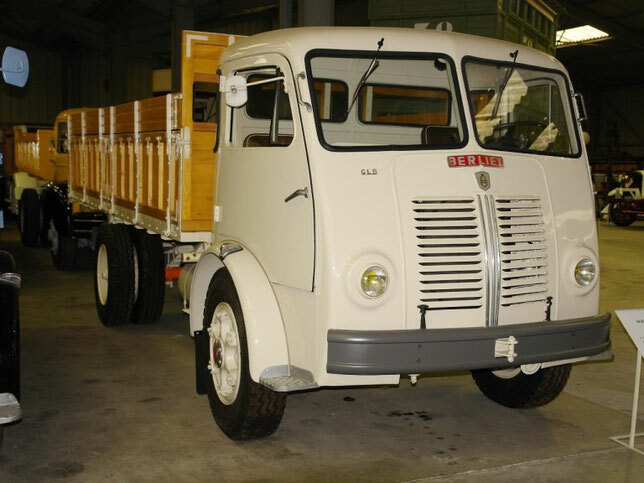 In 1951, the most famous series of heavy vehicles "Berlie GLR" was introduced, which many years later were recognized as one of the best trucks of the 20th century. Their serial production began in 1953. The most famous representatives of this family were the GLR8 cars with a new 5-cylinder diesel engine "MDU" with a working volume of 7.9 liters. And a power of 125 hp. With the head of the Ricardo Comit III unit, a 5-speed gearbox, an air brake system and a power steering. On semitrailer tractors "TLM" 6-cylinder diesel engine (150 hp) was used. Since 1952, they have produced a series of "GLC6" with a 4-cylinder diesel "MOX" (6.3 liters, 95 hp), which gave life to a large family of full-drive cars designed for export to Africa. The first of them in 1955 was the full-drive model "GLC28" with a total mass of 11.5 tons with a 145 hp engine, which turned into a famous all-terrain vehicle "GLC8" (6 × 6) in a year. Until 1977, 32,000 such machines were manufactured in various designs. The success of the GLR / GLC family allowed the company to significantly strengthen its position and increase the production of heavy chassis from 2 thousand in 1952 to 10 thousand by the mid-50's. Since that time, the implementation of a new research program has begun, which put "Berlin" among the most advanced companies in the world. In October 1956, the first diesel engine with a turbo (9.5 hp, 175 hp), intended for a new series of GLM trucks, was shown at the Paris Motor Show. In this most productive in the history of "Berlin" time, it strengthened its potential by adding small firms "Laffly" (Laffly) and "Rochet-Schneider" (Rochet-Schneider). The "Hit" of the late 50's in France was the "GLR8R / M" hooded truck with a gross mass of 16-18 tons equipped with a 5-cylinder "MDU" diesel engine with a capacity of 150 hp. With the head of the "Comit III" block and more streamlined front part of the cabin. No less popular version of the "GLM10R" with a gross mass of 19-21 tons was a 6-cylinder) engine "MDZ" with a turbo (180 hp). On their basis, the tractors "TLR10" and "TLM10R" were manufactured for road trains with a gross mass of 2b-40 tons. In those years, the company "Berliet" organized a series of expeditions through North Africa through the Sahara sands with a length of 8-10 thousand kilometers. The most famous was held under the leadership of Paul Berlie from November 1959 to January 1960 from Algeria to Fort Lamy on Lake Chad. It was attended by 9 full-drive trucks "GBC8" (6 × 6), which received the nickname "Gazelle" (Gazelle), with 5-cylinder diesel engine "MDU" (150 hp), 2-disc clutch, 5-step transmission, power steering. On their chassis installed side platforms, dump bodywork and hydraulic cranes. At the same time, the company was working on the modernization of diesel engines. In 1959, the previous vortex chamber models were replaced by diesel engines with direct injection and a hemispherical combustion chamber in the piston head (process "VI"), produced under the license of the German company MAN (MAN). They provided increased power and higher torque at low rpm, were more economical and less noisy. The range of new diesel engines "MDO" included 4, 5 and 6 cylinder engines with a capacity of 95-240 hp. 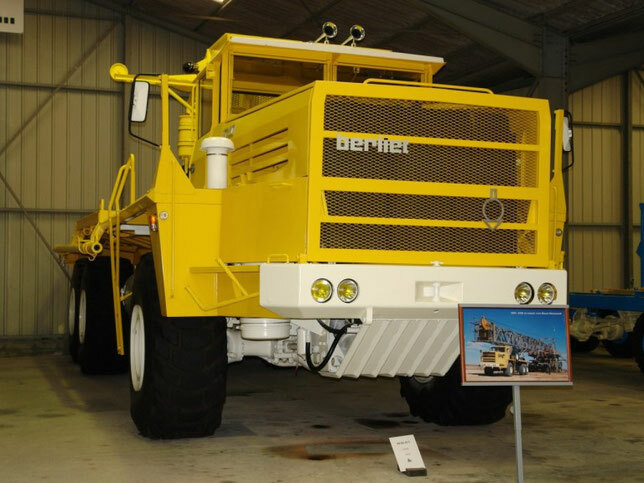 Thanks to them, the "Berliet" super heavy trucks appeared for work in heavy traffic conditions and sands of the Sahara. About these machines today they say that it was they who discovered and mastered the Sahara. The first of this series, developed by designers Andre Billiez and Girard, was in 1955 a standard 2-axle tractor truck "TLM15" (4 × 2) on the chassis of the truck "GBM15" with a 6-cylinder Diesel engine «MS640» (14,8 l., 200 hp). Since 1959, the engine was turbo-charged and developed 240 hp. In 1957, the production of a special "Saharan series" began, consisting of 3-lorries "GBO15P" (6 × 2, 6 × 4 and 6 × 6) and truck tractors "ТВО15" for road trains with full weight up to 60 tons. They used the already mentioned engine with supercharged capacity of 300-320 hp. Since 1968, an American diesel Cummins (Cummins) with a capacity of 335 hp has been used on TVO15M. All cars had 2 disc clutches, a 5-speed gearbox with a 4-speed additional pneumatically operated box , Spring suspension with hydraulic shock absorbers, two fuel tanks of 500 liters. Cars had a mass of 20 tons and were intended for road trains with a gross mass of up to 95 tons. A total of about 50 of them were made. For road trucks in the late 50's. A new modern all-metal cabin was developed over the Relaxe engine, a 5-speed gearbox and a pneumatic drive for drum brakes. All these new items and the 4-cylinder diesel "MDX24 Magic" with the head of the "Comit III" (6320 cm3, 120 hp) were used for a new range of medium-sized trucks "GAK" with a total mass of 7.5-10, 5 tons, capable of developing a maximum speed of 80 km / h.
In 1959, Berliet began developing a lighter truck family, which was developed in 1964 with the beginning of close cooperation with the company Citroen (Citroen). 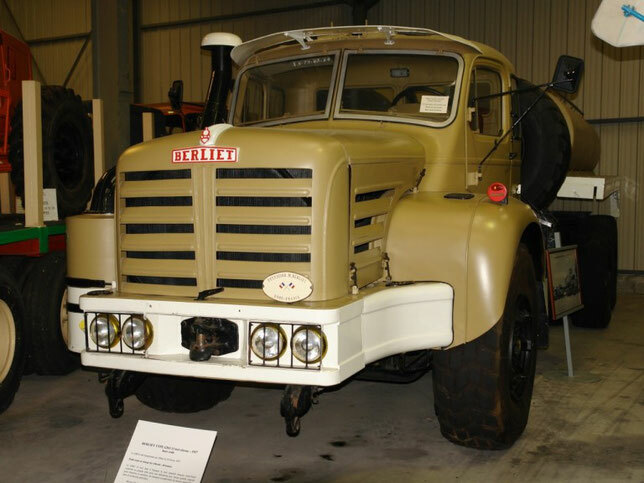 The first result of the cooperation was the presentation on May 15, 1965 of a new truck "Berliet Stradar" (Stradair) with a short forward angular bonnet and a backward-tilted radiator grille. The form of the all-metal cockpit was created in the bureau of style "Berlin" under the direction of Girardin (Girardin) and with the participation of the independent designer Philippe Charbonneaux. Peculiarities of the design are pneumatic suspension of all wheels (4 pneumatic cylinders at the rear and 2 front) and drive to both the rear and front wheels, at the request of the buyer. The first Stradar 20 (RS612) model with a gross mass of 9 tons was initially equipped with its own 4-cylinder diesel engine M420 / 30 with direct injection (5880 cm3, 120 hp), and then with the English engine Perkins 4.236 ( Perkins). In the next two years, the Stradare range was expanded to 12 on-board models with a gross mass of 6-12.5 tons and 5 truck tractors for operation as a part of road trains with a gross mass of up to 19 tons. On the basis of "Stradera" for a while they produced a front-drive delivery vehicle "Tekel" with a wheel arrangement of 6 × 2, four rear wheels of small diameter and a small loading height. They were not widely spread, mainly due to the low reliability of the pneumatic cylinders and the insufficient strength of the structure: up to the end of 1970 only 5944 cars were assembled. 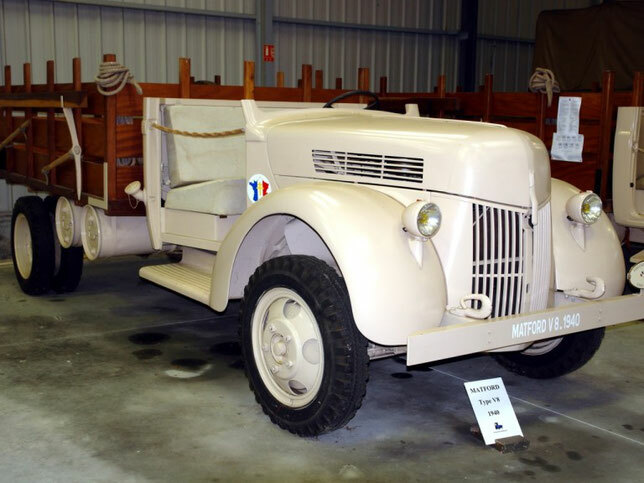 Since 1967, they have been replaced by a series of "Berliet-K", which included the latest development of Citroën. Under the brands "Berlin-Citroen" or "Berlie" produced several variants with a total mass of 4 to 17 tons (models from "180K" to "950K") with power units and a cabin from "Stradera". But soon this unusual cabin was replaced by the model "CS", and then - an even simpler and more rational "Club" (developed by Citroen). Citroën's cargo compartment completely dribbled with Berliet in 1974, and the K series was upgraded to the last days of Berliet in the modernized version of KB. Cooperation with Citroen allowed to increase by 1969 the total production of trucks to 24.6 thousand, of which the share of former machines Citroen accounted for 4.5 thousand pieces. In the catalog of that time Berliet advertised a range of 77 variants of standard cargo chassis, 35 all-wheel drive versions, 18 chassis of fire engines and 30 types of buses. The most glorious day in the history of Berliet seems to be October 2, 1957. That day, shortly before midnight, a 3-axle truck "T100" with a length of 13.4 m was delivered to Paris at the opening motor show in an atmosphere of excitement. ., 5.5 meters wide and 4.5 meters high. The company "Berlie" has created this giant with the wheel formula 6 × 4 for development of difficult areas of North Africa and for transportation of heavy oil production equipment. On the first copy there was a diesel engine "Cummins" V12 (30 l, 600 hp) with two turbochargers, weighing 2.5 tons. Subsequently, its power was brought up to 700 hp. The car could move at a speed of 35 km / h and with the cargo consumed 640 l. Fuel per 100 km. At a total mass of more than 200 tons, the specific pressure of its wide-profile tires of 2.2 m in diameter did not exceed the pressure of the camel's foot on the sand. In total, 5 T100 vehicles were built with a cargo platform and a dump body, and the dump truck had a cab above the engine. They used 5 different mechanical hydromechanical gearboxes, and also tested the Turbomec gas turbine. To each "T100 was given a pilot car" Berlie Gazel "for the transportation of spare parts and a special jack. Until now, only one copy of the T100 has survived. In 1968, the first heir to the well-known series "from the Khars giants" - cars appeared; "GPO71P" (6 × 6) with a carrying capacity of 45-50 tons with a platform for 11.9 m and a width of 7.0 m, an American diesel engine "GM-V12" with a working capacity of 14 with a capacity of 425 hp . And automatic; 6-speed Allison gearbox. With developed speed 64 km / h spent 140 liters of fuel t 100 km. Two years later, at the Paris Motor Show, a heavier 50-ton GXO truck appeared, counting on rivalry in Africa by the American Kenworth-95: (Kenworth). From September 1971, at a temperature of up to + 44oС, he began to carry goods at the average speed of 34 km / h along the highway Hasa Messaud (Algeria), a length of 510 km. Of which 415 km. Fell on the sand dunes. It was equipped with a GM engine V (18.6 liters, 530 hp) and an automatic 5-speed transmission "Twin Disc" (Twin Disc). This car could not stand the competition of American companies and remained in a single copy. In 1972, a series of crane chassis "PG" with a wheel arrangement of 6 × 4 or 8 × 4 with a gross weight of up to 63 tons was added to the heavy car range. Thanks to Paul Berlie, the company not only has not lost its positions, but has also accelerated to become the largest in France and one of the most powerful and authoritative manufacturers in the world of medium and heavy trucks. For the first time after the war, its personnel increased from 5 to 21 thousand people, two more plants were built near Lyon (in Burg-en-Bresse and Saint-Priests - in the neighborhood of Venice), enterprises in Algiers (1958) and Morocco (1959), a research and educational center in Saint-Priests (1962). In 1970, based on the company "Guinard" (Guinard), a branch of KAMIVA (CAMI-VA) was created for the production of fire equipment and a year later - another assembly plant in Arblesl. At the enterprise in Venice it was established the production of a range of trucks with a gross weight from 10 to 38 tons, tractors for road trains with a gross mass of up to 50 tons, as well as special machines. Under license, trucks and buses "Berlie" were collected in Poland (since 1974), Senegal and Cuba. Cars of this brand were delivered to more than 60 countries of the world, including the USSR. In the late 60's. The development of the second generation of diesel engines with the injection system under the license of MAN was started. Initially, the program included 6 and 8-cylinder V-engines (models "V600", "V800", "V825") with a capacity of 130, 170 and 280 hp. The greatest hopes were placed on the 300-strong version of the V825 ", Which since February 1971 was installed on the truck tractor" TR300 "with a new reclining cabin" KV2400 ", but it proved to be unreliable and lowered the reputation of the company. Two years later, his upgraded version of the "V835" with a capacity of 310 hp. Began to be used on trucks and tractors of the heavy series "GR / TR / TRH320" (for road trains with a gross weight of up to 120 tons). In May 1977 it became the first production diesel V8 with a turbocharger that allowed to raise the power to 352-356 hp. They were equipped with the GR / TR 350 range, and for special TRH380 tractors the power was increased to 380 l. S .. Independent work on 6 cylinder units since 1971 was limited to a systematic upgrade of the in-line 12-liter "MS635" engine, which turned out to be one of the most economical and successful developments of "Berlie". It had direct fuel injection with a vertically mounted high-pressure nozzle, a toroidal combustion chamber in the bottom of the piston and had an increased torque. Subsequently, the motor, which developed 250-266 hp, received the name "Maxiplex" (Maxicouple) and the new designation "MDS 06.35.40". It was used on the "GR / TR260" and "GR / TR280" series, as well as on the "GBH280" dump trucks. In May 1977 the version "MDR 06.35.40" was equipped for the first time with a turbocharger and intercooling of charge air. On trucks "GR305" he developed 300-305 hp. This allowed to expand the range of "Berlie" trucks up to 14 basic series by 1974 with the total weight of a single car up to 38 tons. In the late 60's. Production of 2-axis quarry dump trucks with the carrying capacity of 22-60 tons (models "T22", "TZO", "T45" and "T60") with American units began. For example, the most famous model of the "T45" with a gross mass of 84 tons was installed a 2-stroke diesel engine "GM" V16 (18.5 liters, 635 hp) and a 6-speed automatic transmission "Ellison" . In the 70-ies. 30 dump trucks "T60" were sold in the USSR. In addition, in a small batch they produced a articulated articulated dump truck "TX40" with a carrying capacity of 40 tons with a diesel-electric drive of all four wheels. Under the brand "Berlin" also produced buses, trolleybuses, army special all-wheel drive trucks and armored cars "VXB". During the energy crisis of the 70's. Paul Berlie began to actively seek opportunities for mutually beneficial cooperation with larger firms. But the French government, having lost the firm Unic, which went to the IVECO concern in 1975, decided to prevent a similar situation with the Berlin. It allocated the necessary funds, and in 1978 the state enterprise Renault (Renault), having secured the highest decision of the President of France, bought the firm "Berliet". The new association was called Renault Vehicules Industriel, known under the abbreviation of the RVI (RVI). Initially, the association with "Reno" had a beneficial effect on the future activities of "Berlin". Together, the companies adopted a broad program of renewal of the entire range and investments to rationalize the production and development of new cars. The production of the "KB" series was discontinued (with the exception of the "950KV6" model), and the "Berliet" plants focused on the production of the heaviest tractors "TR280", "TR305" and "TR350" with the upgraded cab "KV2480" or "Premiere" (Premiere ), Fully satisfying all the ergonomic requirements of its time. One of the objectives of the merger was to create a more complete range of trucks, adding to the heavy vehicles "Berlin" a series of medium trucks SAVIEM (SAVIEM), also part of the RVI. As a result, in 1978 appeared the so-called "rational" gamma "GF / GR", which was a SAVIEM chassis with a diesel engine "Berliet 06.20.30" with a capacity of 195 hp. And the new cabin "Club". The last independent development of "Berlin" in 1980 was the truck "MS300", which was the development of the "GF" series and intended for production at the American firm "Mack" (Mack). The last car of the brand "Berlie" was manufactured on April 21, 1980. 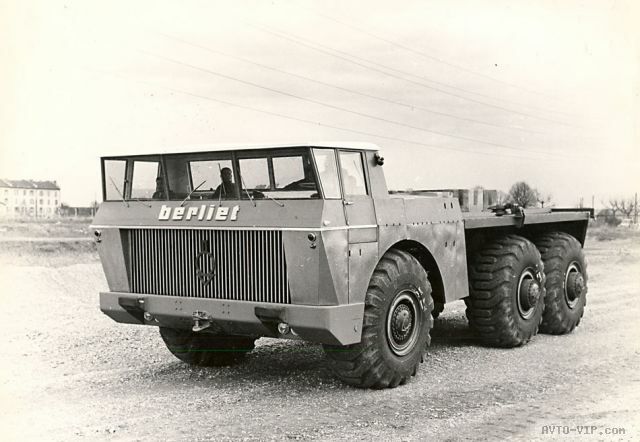 Heavy vehicles "Berliet" became the basis of the new series "G" and "R" of the firm "Renault". Paul Berliet in 1982 became president of the public foundation, which received the name of his famous father. By common efforts it was possible to collect almost all the main cars of the brand "Berliet". The oldest truck of France - "Berliet M" stored in the fund in 1910 - on November 2, 1988 received the official title "National Technical Monument". The name of Marius Berliet is today worn by the modernized Renault plant in Venice.